Wild Flowers Scented Soap Petals. Place in a dish to brighten up a bathroom. Each bud is so realistic that it will be hard to tear off a few petals to use for single-use hand washing. $9.99. World Market. L'Occitane Glamorous Gift Box. Pick five of her favorite L'Occitane beauty essentials and they'll be packaged for her in a gorgeous gift box. We recommend filling it with the Shea Butter Hand Cream, Immortelle Divine Cream, Almond Shower Oil, Immortelle Divine Youth Oil and Lavender Foaming Bath. Price varies depending on the products you choose. But if you spend $55 or more, you'll also receive a Terre de Lumière gift box with a L’Eau Eau de Toilette, L’Eau Beautifying Body Milk and L’Eau Gentle Shower Gel. L'Occitane at SouthPark Mall. "Mom" Stemless Wine Glass. Toast mom with this wine glass decorated with genuine gold. $14.95. Williams Sonoma. Pearl Tulle Social Stole. From Karl Lagerfeld Paris, the famous Chanel designer Karl Lagerfeld's lower priced line. $79. Dillard's at SouthPark Mall. 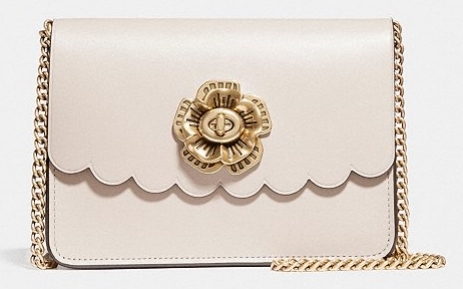 Bowery Crossbody With Tea Rose Turnlock. This petite leather purse comes in two colors (chalk or peony) and has a convertible chain that can be worn long or short. $250. Coach at SouthPark Mall.